The Latham’s Anodorhynchus hyacinthinus is a bird belonging to the order of the Psittaciformes, family Psittacidae and genus Ara. As already stated, the specimens of the family Psittacidae are the true parrots, and in particular those of the genus Ara have the most beautiful plumages of the class of the birds (Aves), both for the texture and for the chromatic point of view. 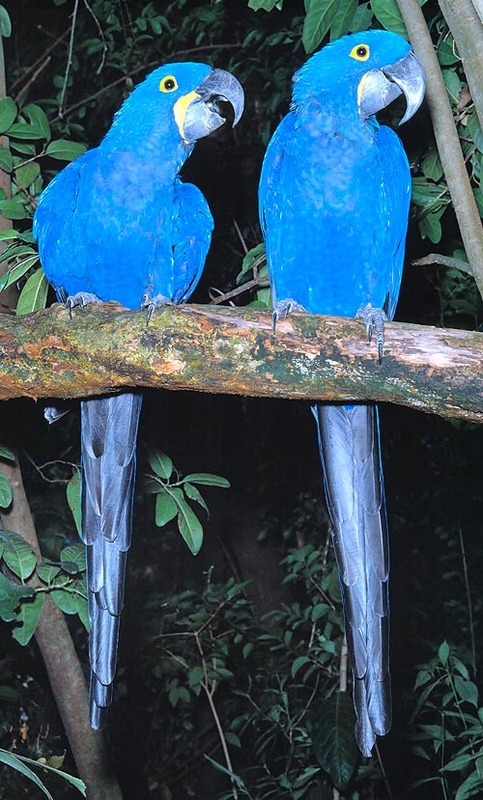 In this case, the Anodorhynchus hyacinthinus – Latham, 1790, commonly called Ara giacinto in Italian, Hyacinth Macaw in English, Ara jacinthe in French and Ara jacinto in Spanish, has a brilliant cobalt blue colouration covering the whole body, but the beak. It’s matter, therefore, of a monochromatic species, even if the existence of a Dyck texture provides, in both sexes, different intensities of colour in the various parts of the body. So, there is no sexual dimorphism, even if, to tell the truth, in the young males, the presence of a ring of bare yellow skin around the eye and a stripe of the same texture and colour on the sides of the beak, associated with a lighter body structure, can be utilized as dimorphism markers. But, often, these biometric parameters disappear in more aged specimens, and consequently the dimorphism extinguishes. This bird was discovered in 1790 by the English biologist, ornithologist John Latham, who is considered, rightly, the scientific father of Oceania ornithology, having studied and reported the life, habits, the alimentary ecology, the ethology of several endemic birds of Australia, New Zealand and other lands referring to this continent, both in situ, and also analyzing the specimens which were coming in the United Kingdom for being exposed in the huge London Zoological Garden. Among these, we recall the Emu (Dromaius novaehollandiae) and the Wedge-tailed Eagle (Aquila audax), the largest Australian raptor. He was the first to describe the Anodorhynchus hyacinthinus, about which he refers in his work “General History of Birds, 1821-1828”. Some species similar to the Anodorhynchus hyacinthinus do exist. 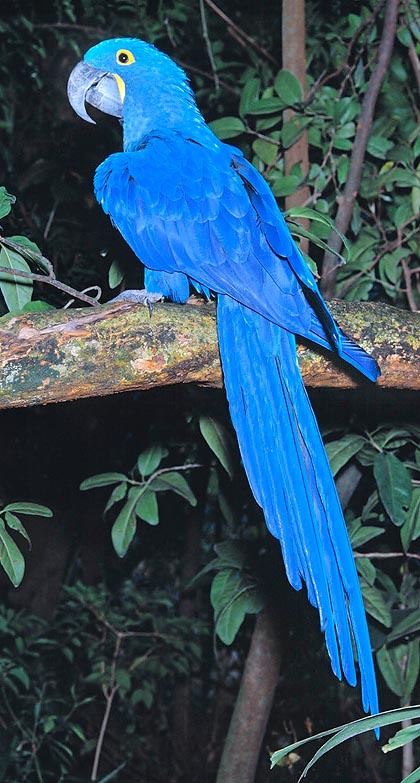 First of all, the Spix’s Macaw (Cyanopsitta spixii) which would seem extinct in the wild and present, under captivity, in some Zoos of the Philippines. The conditional form is compulsory, as it looks like that the species is watchfully guarded for speculative purposes, for getting a conspicuous benefit whether it would be possible to reproduce it, thing which, obviously, has not yet happened. It was discovered in 1840 by Charles Lucien Jules Laurent Bonaparte, biologist naturalist, Napoleon Bonaparte’s brother, together with the German biologist, zoologist Johann Georg Wagler, and the name of Spix’s Macaw (Cyanopsitta spixii) was given in honour to the German biologist naturalist Johann Baptist von Spix. One of the reasons of the extinction in the wild of Cyanopsitta spixii , excluding hunting and seizing, stands in the introduction of the Africanized bee, a biologic hybrid which, with its honeycombs, steals them the room necessary for building the nests, and kills the pullets with its poisonous bites. This bee was born from an original and fortuitous hybridization, happened in 1957, between a swarm of queens of African honey bees of the species (Apis mellifera scutella), of Tanzania, and two European subspecies (Apis mellifera ligustica and Apis mellifera mellifera), which escaped from an animal husbandry of the Brazilian biologist Warwick Estevam Kerr. The Spix’s Macaw, which reaches the 56 cm of length and the 295-400 g of weight, can live up to about 28 years. Another similar species is the Lear’s Macaw (Anodorhynchus leari), always discovered by Charles Julien Jules Laurent Bonaparte in 1848, almost extinct in the wild, with a length of 70 cm and a weight of 350-460 g. And another one, a smaller species of the Anodorhynchus hyacinthinus extremely rare in captivity, reaches the 65-70 years of age. Finally, another alike species, by sure almost extinct, is the Glaucous Macaw (Anodorhynchus glaucus), seen that no alive specimens, and obviously not even in captivity, have been sighted since the XVIII century. In fact, by that time, they were present in the wild of the South American pluvial forests. It was discovered between 1780-1790 by the French biologist ornithologist Louis Jean Pierre Vieillot who described it in his work “Ornithologie Française” (1820-30). It resembles, after the drawings contained in the Ornithology texts of the time, to the Anodorhynchus leari, but with a plumage with a rather different shading. The Anodorhynchus hyacinthinus is a parrot which gets much devoted to its owner, when tamed is very docile, almost like a dog, even if with its strong beak with which it breaks the shell of fruits with hard pericarp, like the Brazil nuts, it might tear off a finger to a person, with the same facility with which a man can pick up a daisy from a lawn. Actually, in captivity, aggressive phenomena towards the human being have never happened, on the contrary, affection gestures towards the man are frequent. It is an excellent imitator of sounds and voices, besides being capable to perform ability exercises, these characteristics have been, since ever, besides the beauty of its plumage, the determining cause of its capture. Mainly in the past, it was utilized as domestic bird to be kept in vast aviaries, in the context of gardens of nobiliary mansions, mostly in the tropics, or in Europe, they were, for instance, very frequent among the Spanish and Portuguese nobles. Its range is limited (if we can say so), to southern America. It is more frequently sighted in three specific zones: in northern Brazil, between the states of Mato Grosso, Parà, Piaui’, Maranhão and Tocantis, in northern Paraguay, Concepcion department, and in north-eastern Bolivia, Santa Cruz de la Sierra department. It is present, maybe even abidingly, in the northern part of the Brazilian state of Amapà, in the pluvial forests and in the bush. It has colonized different types of habitats and biotopes, both the trees of the pluvial forests and also the prairies close to such forests, it can be found in the tree-covered savannahs of South America and in the brushwood or the bush. Obviously, its typical zygodactyl foot , leads it to carry, more frequently, an arboreal life. Among the chosen trees on which they rest and form the nests, are palms of various kinds, of which they eat the fruits, located by the edges of the forests, inside which, on the contrary, they utilize deciduous trees. Another habitat where they are often found if the Cerrado (circumscribed or closed space, in Spanish and Portuguese), which is the tropical savannah, the richest in vegetal and animal biodiversity between all the savannahs. Another typical ecosystem hosting them is the Pantanal, the largest wetland in the world, located between Brazil, Paraguay and Bolivia. Presence of a great head, connected to a short and bulk neck; a particularly developed, robust and hooked beak; limbs with zygodactyl feet, where, of the actual 4 fingers, the second and third are directed forward, the first and fourth backward thus to allow an easy grip on the branches of the trees; the upper part of the beak is mobile in respect to the bones of the skull; the tail formed by 12-14 rectrices; the presence of “dusters” scattered all over the body called also powder-puffs which produce a very thin powder, white, oily to the touch, which spreads on the plumage and which is produced by the terminal cells of the beards which decay and fall to pieces after having reached a certain development. This powder renders the feathers waterproof to the water, ecologic adaptation in an ecosystem, like the tropical one, where thousands of millimetres of atmospheric rain fall during all the year round. The eyes, brown, and the mandible, are surrounded by a pale yellow skin, mainly in the young male specimens. Very long living species, it can get over the eighty years of age, the wingspan is 120-130 cm and the weight is of 1,4-1,8 kg. It’s a parrot presenting a particular diet and alimentary ecology. It is both granivorous and frugivorous, as it nourishes of nuts and fruits of various palms, like the Mauritia flexuosa, the Attalea speciosa, the Attalea phalerata, the Attalea maripa, the Syagrus coronata and the Acrocomia aculeata. They are also greedy for the figs of the species Ficus, berries and buds, but have also the capability to nourish of molluscs and aquatic crustaceans, whose shell is broken with their powerful beak, and also of insects (Lepidoptera, Coleoptera, Orthoptera) and other invertebrates. It has a sweet character, gets easily affectionate to its owner, it has excellent capacity of vocal imitation. When captive, besides spacious aviaries, it must be given also robust logs, which it barks with the robust beak. In the wild, often, it forms flocks of about ten kin, which are very noisy and easily identifiable in the forests. It is particularly active during the day since from the morning. It leaves the roosting tree, going around looking for food till evening, when he will come back for resting. Due to its huge size, when in captivity, for creating its nest, we can utilize even big drums. In the wild, the male builds the nest inside the cavities of great trunk trees. In the region of the Mato Grosso, seen the particular physic geography which characterizes it, they utilize cavities inside crags or great projections. Like other Psittaciformes living in the tropical, subtropical areas where a specific rainy season doesn’t exist, these birds do not have a mating season with a well marked beginning and ending. Even if, objectionably, they reproduce with more difficulty between August and December, both in the wild and in captivity, if compared to the period included between January and April. The females of Anodorhynchus hyacinthinus, like the females of many other species of birds, are called, for what the deposition of eggs is concerned, as with determined eggs deposition, that is, the female lays a quantity of eggs after the coupling corresponding to the number for which it is programmed, if such eggs are taken off before the brooding, or added before the deposition, artificial or fake eggs, we shall get the female laying always the same number of eggs. This is exactly the contrary to what happens in other species, for instance in the Galliformes, such as the Domestic chicken (Gallus domesticus), where the deposition ceases only when the female sees that the number of eggs it deems visually correct has been reached. Probably there are some neuro-endocrine signals starting from the sight and these interrupt the ovulation cycle. In this case if, for instance, the farmer, as usually it happens by early morning, when the hen has just laid the egg, takes off the same at once, the hen will lay down immediately another one, without beginning to brood; if, on the contrary, an artificial egg is placed in the nest, the hen will not lay the egg but will assume a brooding behaviour, that is, going broody, and this is called in biology an undetermined deposition. Usually, the female of Anodorhynchus hyacinthinus lays one or, at the most, two white eggs, which will be brooded during 28-30 days. The male will compel the female to take care of the offspring and to protect it against possible predators, whilst it will look for the food, providing it also to its partner, whilst the pullet will be nourished by regurgitation by the father itself. A curious (and sad) matter is that usually only one of the two eggs brooded will hatch, but should both of them open, only the first-born of the two pullets will be nourished, the second-born will be left dying of starvation. The young remains with the parents for about one full year, or even more, of post-natal life. There are about 2.500 captive specimens, but the pressurizing alteration of the habitats made by man for agricultural purposes, to which are to be added the incidence of seizing for commerce and of the preying done by skunks, jays, toucans, crows, coatis, which eat the eggs, has reduced such species to a few thousands of specimens present in the wild. Therefore, the CITES controls strictly its traffic and the IUCN has inserted it in the red list of the Endangered Species. Spix’s Macaw (Cyanopsitta spixii), probably extinct in the wild, perhaps some rare captive specimens. Lear’s Macaw (Anodorhynchus leari), very rare in captivity, under extinction in the wild. Glaucous Macaw (Anodorhynchus glaucus ), probably extinct during the XVIII century.